After we ran an exposay on a Chinese Restaurant in Sunnyside Pretoria, we started receiving feedback from more people wanting to expose restaurants they work at. Our recent source contacted us to shed some light on what management instructs them to do at Rhapsodys Sunnypark which is also is Sunnyside Pretoria! According to our source, all expensive bottles of vodka are refilled with cheap Russian Bear vodka. In doing so, the restaurant makes a lot of money because they are selling cheap vodka with higher prices and they save a lot of money because instead of ordering new expensive bottles of vodka they just refill the empty bottles with cheap Russian Bear vodka. 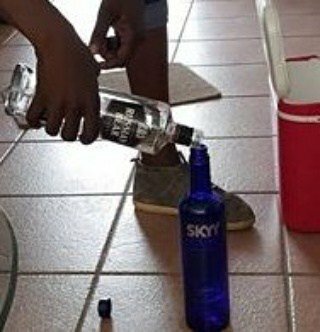 So if you like Rhapsodys and you are a vodka drinker, please take note that you are being cheated out of your hard earned money. You are being served cheap vodka at the price of expensive vodka. Which may result in unbearable headaches in the morning because cheap vodka does that. Our advice to you as our valued reader is that if you are going to order vodka, get the whole bottle and make sure it's sealed and you are the first to open it. Otherwise you could fall victim to this horrible scam. Rhapsodys is not the first restaurant to get accused of selling cheap products at high prices by posing the products as top quality. A famous sea food restaurant in Sandton was once under fire for selling cheap fish at very high prices and labelling the fish as snoek fish. The restaurant only got caught after a customer who is allergic to almost every fish except snoek fish had an allergic reaction to the fish they served in place of the actual snoek fish.